The Dynasty (Chinese) and Samurai (Japanese) game series always features plenty of action. 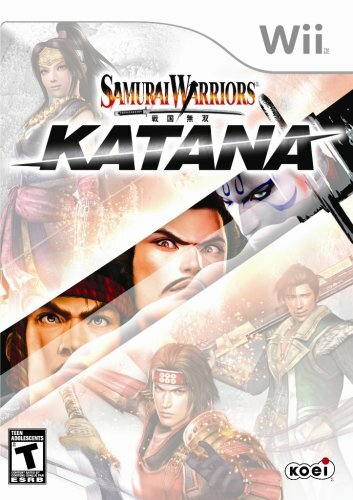 This title entertains and has the potential have a great impact on the next generation Wii console (similar to the jump from Dynasty Warriors on the Playstation to the success of Dynasty Warriors 2 on the Playstation 2), but doesn’t come close to the same “wow factor”, especially in the graphics department. It’s hard to duplicate those rare groundbreaking moments (i.e. Grand Theft Auto III) when making the jump to the next console, but the first person perspective in this title could’ve benefited more from better enemy AI and more depth in the graphics. Players can expect familiar elements and gameplay experiences like engaging waves of formidable foes. This installment also has some interesting moments where your first person perspective and the Wii controls put a nice spin on the action. This game has three main modes. First, the musou mode where battlefields appear as you advance. Then, after paying an entrance fee, the train mode challenges you to win before time runs out (another familiar element). Success in this mode earns you gold for use in the musou mode. Finally, the versus mode has eight battlefields with three battle types, which expand to eight as you progress. This mode could be retitled “mostly co-op” because you don’t really get to fight other players directly. Players get some nice “choose your own adventure”-type story forks where you decide the next action. Both forks have difficulty ratings on it, so you can make an informed decision. The story takes care of the main development (even adding an unlockable chapter), but you must development your character’s fighting development, even using your Mii profile as the hero character fights off samurai and ninjas. Your score increases as you succeed in battle. The controls were a bit unresponsive and/or delayed at times (test things out in the versus mode first to find the best playing area), but the control layout is great. The control icons at the bottom center/left help players memorize the moves quicker. A nice mix of distance attacks with lunging, blocking (using the Z button – can deflect attacks as well) and sword swiping. Navigation works well, but could use some improvement especially when contending with challenging bosses, avoiding traps and turning sharp corners. Improved character AI would make the battles less repetitive as well (stop everything you’re doing occasionally and watch how they interact towards you, then you’ll know which ones to take out first). Spears, swords, bows and arrows remain while new weapons include boomerangs, guns (one shot) and (gulp) cannons. Inventory skills (you can use up to five skills and carry up to four items) and asset management (laid out for you in a self-explanatory control pad icon) are a must. Once you learn the system and the skill items’ characteristics, it’s pretty easy to dispatch enemies (depending on your difficulty level). Evaluation statistics come at the end of the levels, which provide feedback for adjustments and motivation for possibly repeating that level. The graphics have a nice hand drawn theme, but have no noticeable improvement from previous installments. The eclectic mix in navigation ranges from free roaming to “tractor beam” movement where you can concentrate more on the offensive/defensive aspects. Ignorance of the Japanese culture might take some meaning/excitement from this title, but the overall entertainment value and challenges remain solid. It seems producers want players to concentrate the action on defeating waves of enemies, but two player face-offs and possible online play in future installments would be nice. This entry was posted in Video Game Reviews and tagged Michael Siebenaler, Mike Siebenaler, Nintendo, Samurai Warriors, Tall Writer, video games, Wii. Bookmark the permalink.